Whether you’re vegan, lactose intolerant, or following a dairy-free diet, you don’t have to miss out on one of the world’s favorite desserts. Although ice cream substitutes are available, none of them achieves the richness of the real thing or offers the breadth of delicious flavors—until now. Vegan Ice Cream offers decadent frozen alternatives that don’t rely on milk, cream, or refined white sugar. Instead, these luscious recipes use nut milks, fresh fruit, and natural sweeteners to create simple and inventive ice cream flavors, from old favorites like Chocolate Chip and Strawberry to exotic creations such as Pecan Pie, Pomegranate, Kiwi Mandarin, Piña Colada, Chai, Peanut Butter Chocolate Chip, Gingersnap, and many more. 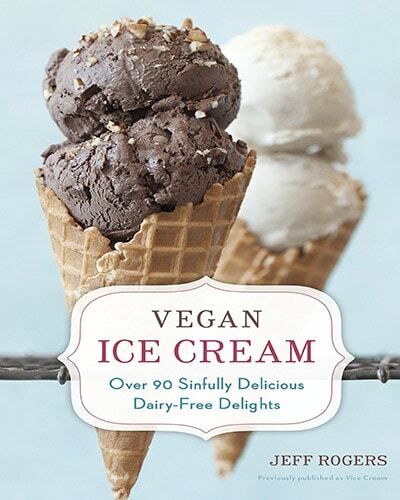 This fully revised edition now features more than 90 recipes, including raw vegan ice creams and sauces, and full-color photography throughout. From the very first taste, you’ll be astonished at just how tasty and rich vegan ice cream can be. Jeff Rogers grew up in Stowe, Vermont, where he became interested in food and tourism. Adapting his diet to improve his health, he eventually became a vegan, eschewing all animal products. But he still craved the premium dairy ice creams he once ate and so used his kitchen gifts to experiment with creating a rich, gourmet vegan ice cream. As he became interested in the raw food movement, he also began to make ice creams with all raw ingredients. Soon after beginning his vegan ice cream venture, Jeff began sharing his desserts with friends. A physician friend noted that in a world where people are trying to eat low-fat foods and fewer sweets, it was naughty of Jeff to create these decadent desserts, vegan or not. Thus, he was dubbed “The Naughty Vegan” and has used the nickname ever since.